Milwaukee Bucks guard Khris Middleton dunks in front of Washington Wizards guard John Wall during the first half of an NBA basketball game. Washington Wizards All-Star guard John Wall underwent left knee surgery and is expected to be ready for the start of next season. The team said Wall had a procedure done to remove calcium deposits in his left knee to eliminate pain and help him heal more effectively. He also had surgery on his right knee, undergoing an arthroscopic lavage procedure to clean out the knee. 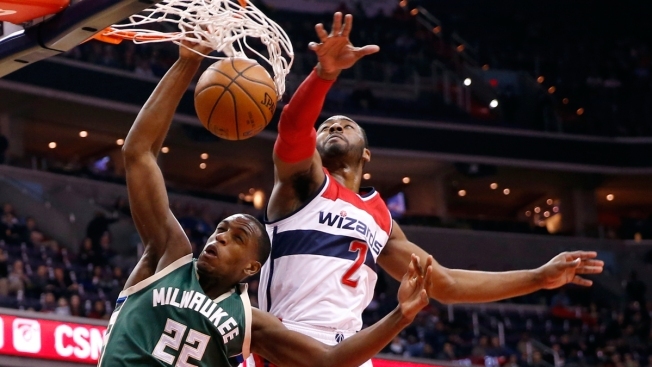 Wall's chances of playing in the 2016 Rio Olympics are likely over as a result. He was among the 30 finalists named for the national team roster. In a statement, Wall promised fans, teammates and the organization that he will be focused on getting healthy this summer in order to lead the Wizards back to the playoffs. Wall set career highs with 19.9 points, 10.2 assists, 4.9 rebounds and 1.9 steals a game. He had a career-best 49 double doubles in 77 games. Dr. Richard Parker, who performed the surgery at the Cleveland Clinic Marymount, said Wall should be able to play without pain once his rehab is done. Wall was bothered by the knee problem late last season. Washington general manager Ernie Grunfeld said the team talked with Wall, his agent and top doctors, leading to the decision for the 25-year-old to have surgery. "John has been a true warrior for us throughout his career and we're confident that his work ethic will have him back leading the team as soon as possible,'' Grunfeld said.